The Class of 2018 said their final farewell to Saint Joseph Hill Academy when they graduated on Friday, June 1, 2018. 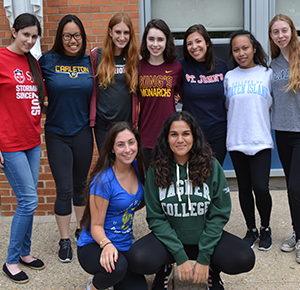 During a particularly competitive college application environment, the Class of 2018 fared exceptionally well. Our graduates were accepted into 200 universities and colleges throughout the United States. This year’s class of 96 gifted women amassed academic scholarship monies exceeding $35.6 million dollars. Every single graduate received academic merit scholarships, not just members in the top of the class. 10 members of this class were accepted into accelerated master’s and doctorate programs in various fields of study, including Medicine, Pharmacy, Physician’s Assistant, Occupational Therapy, Physical Therapy, and Speech Pathology, and 19 members of this class will be participating in Honors and Leadership programs. In addition,16 students in this class were offered full tuition scholarships. 5 students in this class were offered NCAA Division I and Division II athletic scholarships in soccer, swimming and track, and 1 student received a talent based scholarship in music.